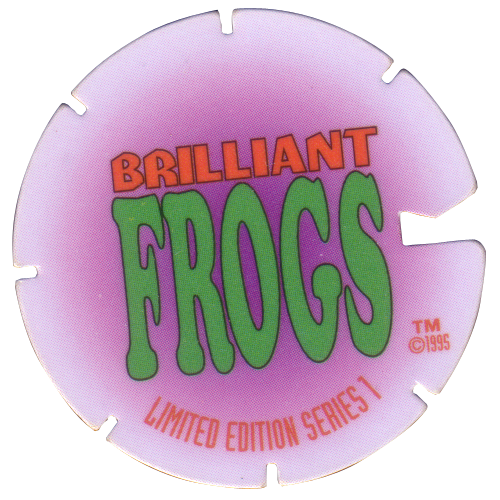 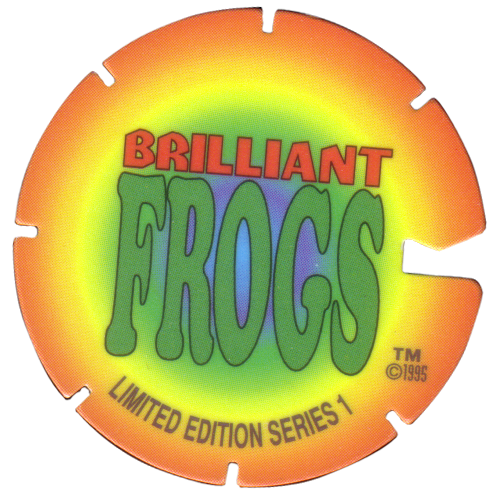 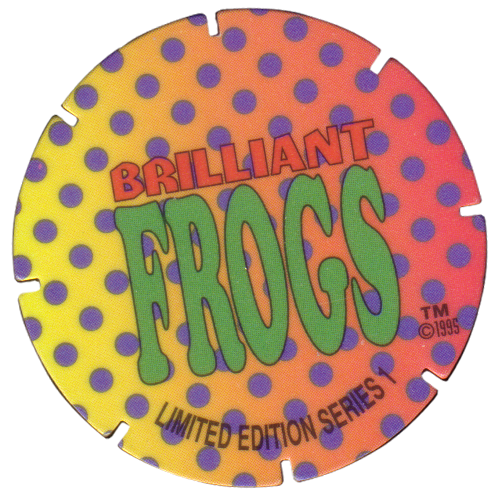 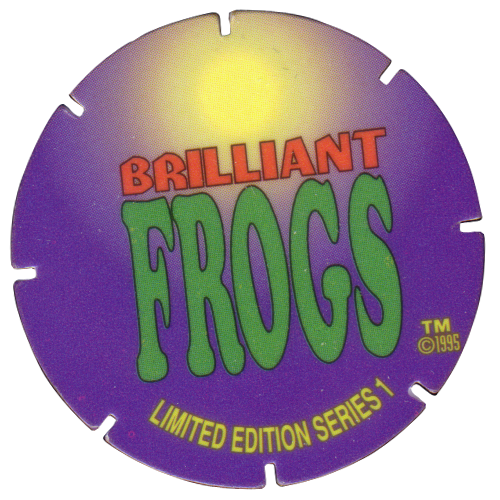 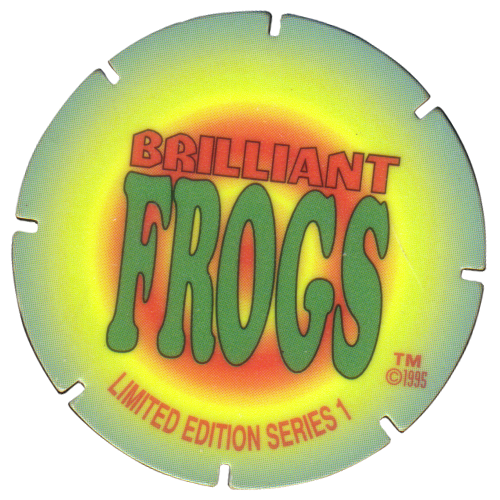 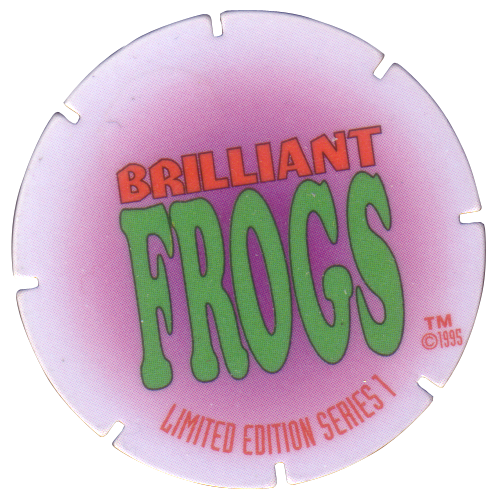 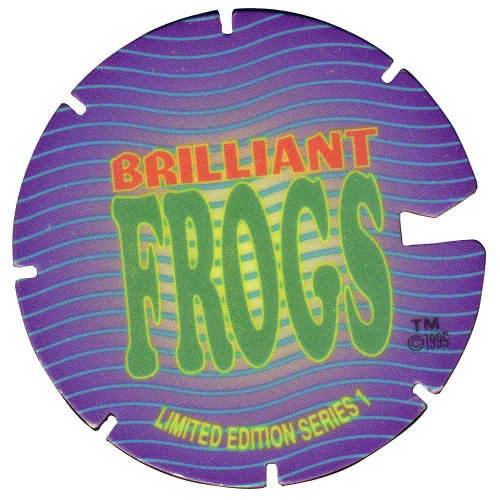 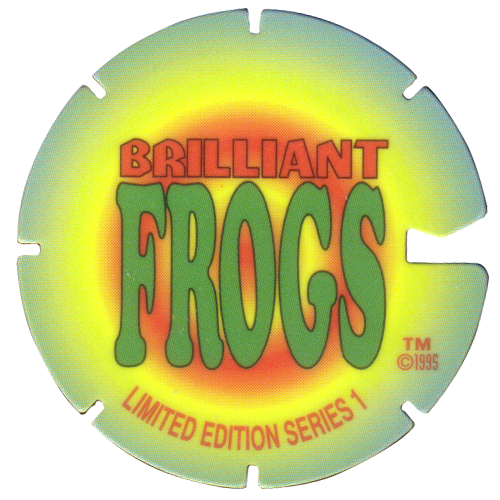 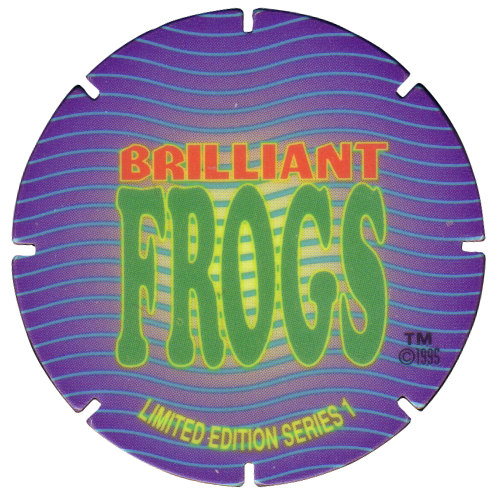 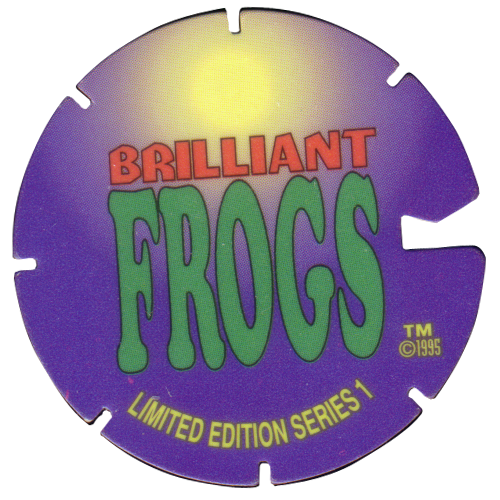 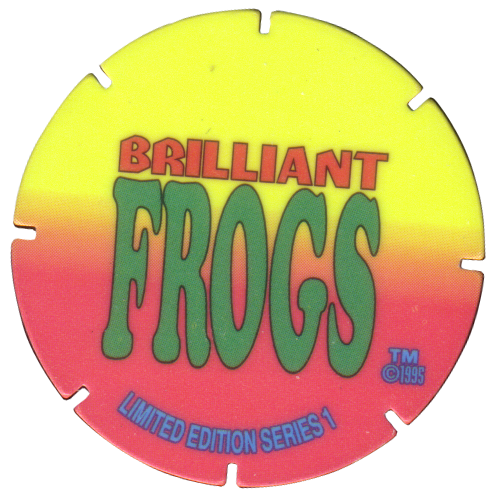 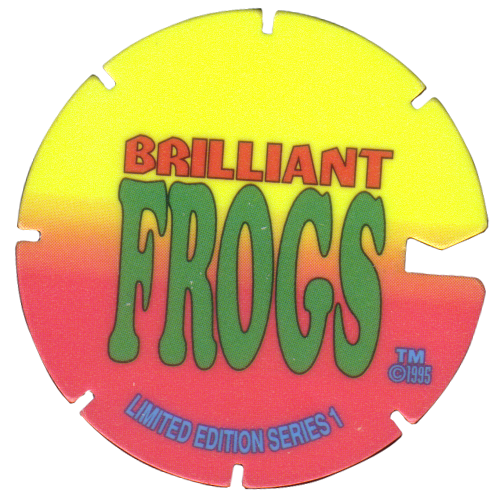 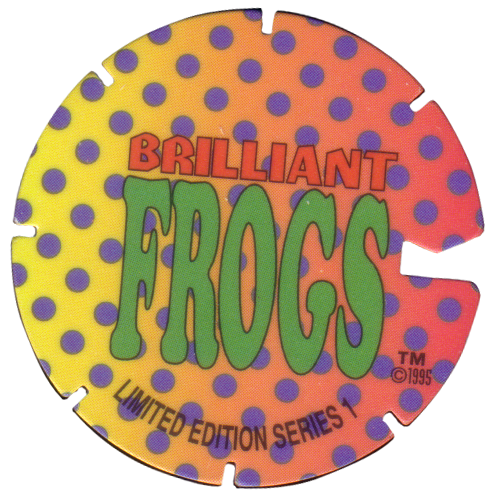 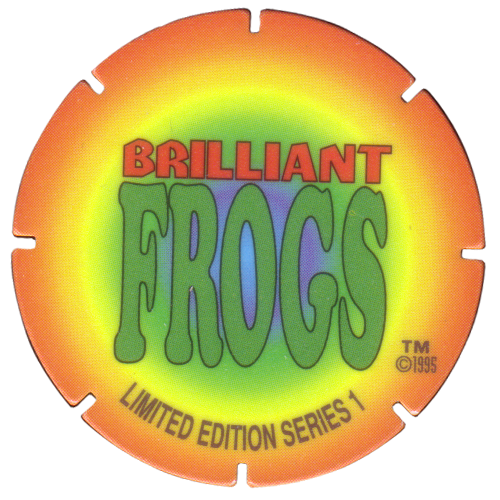 Info:There are probably 130 pogs / milkcaps in the Brilliant Frogs Limited Edition Series 1. 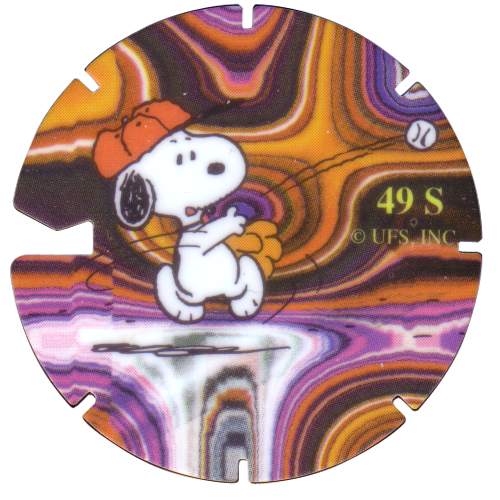 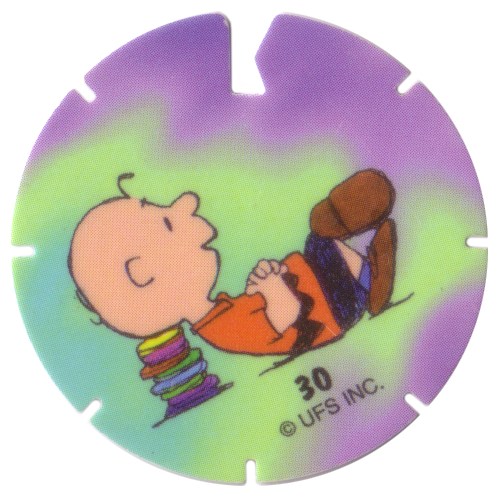 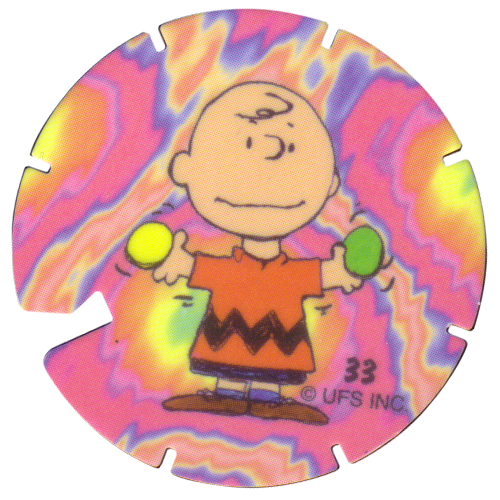 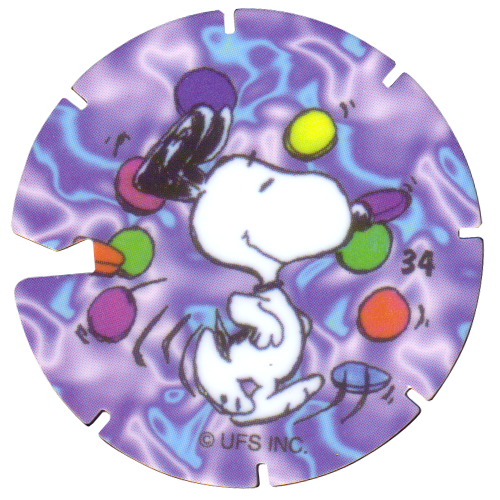 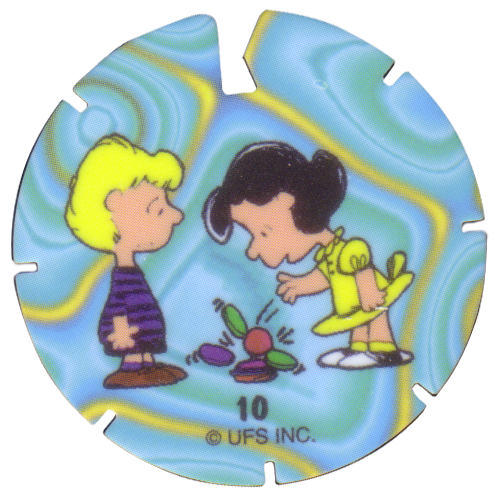 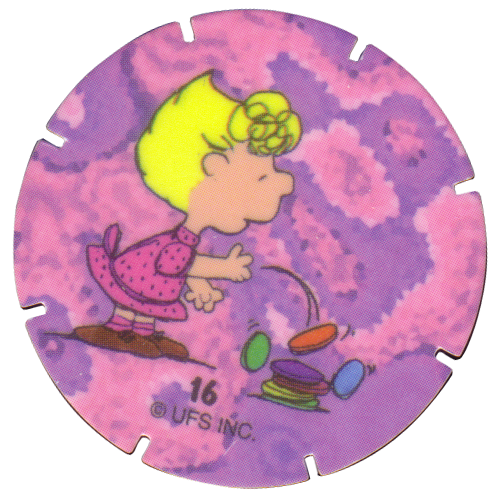 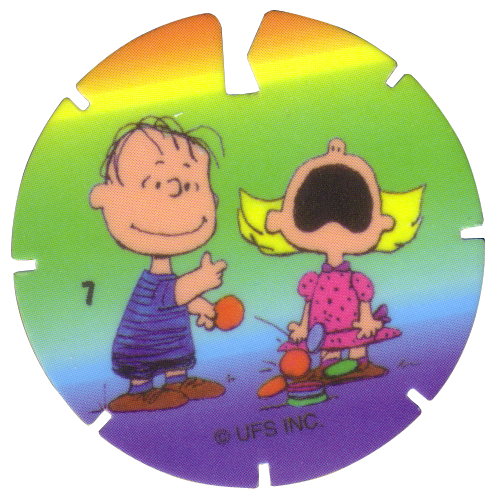 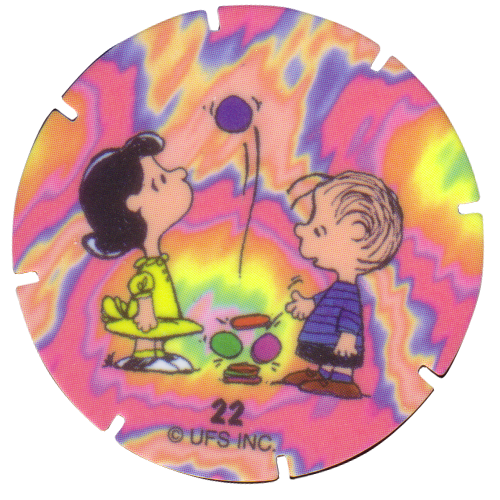 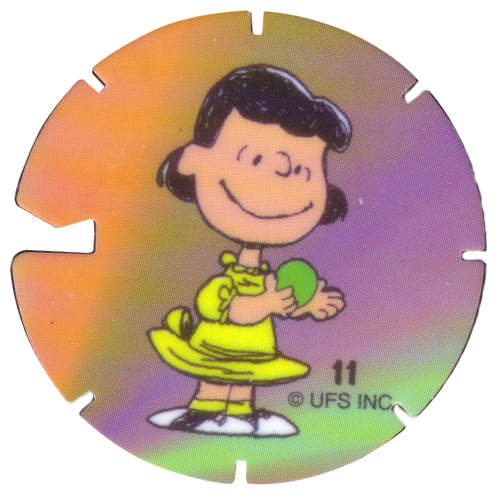 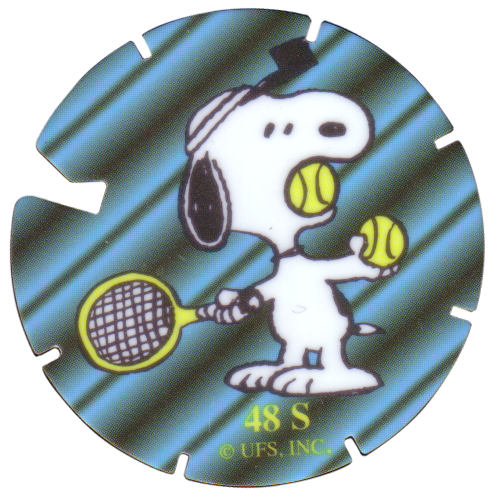 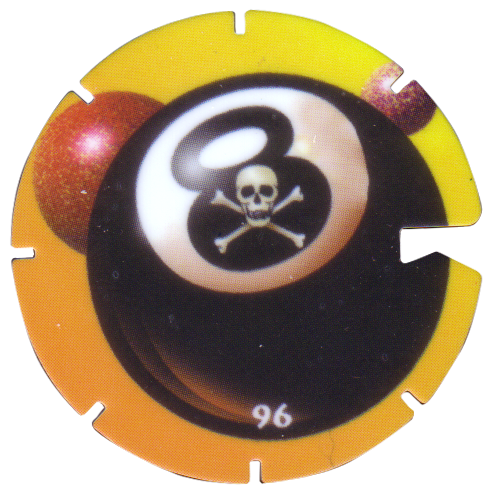 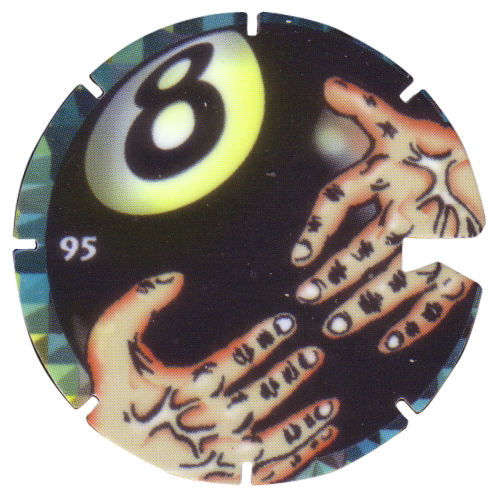 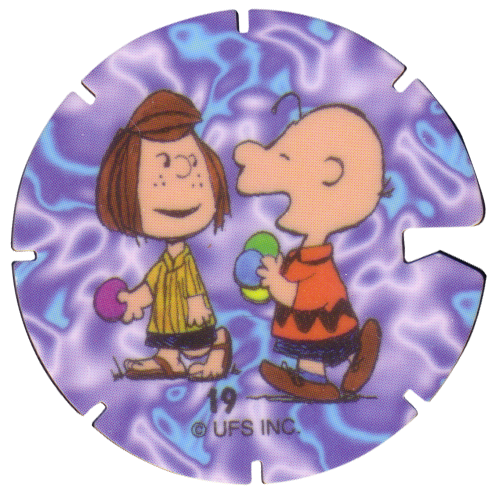 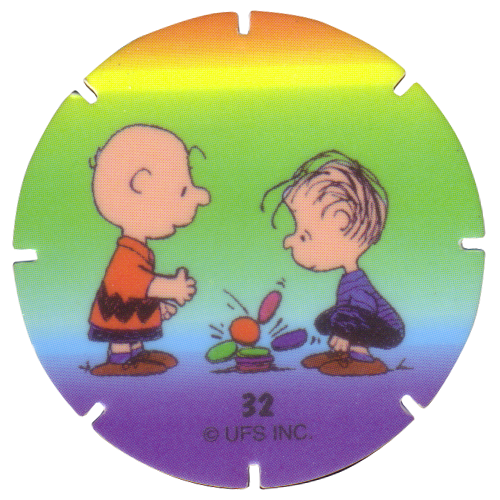 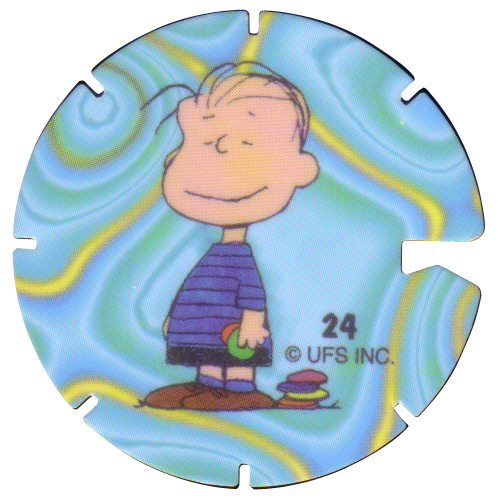 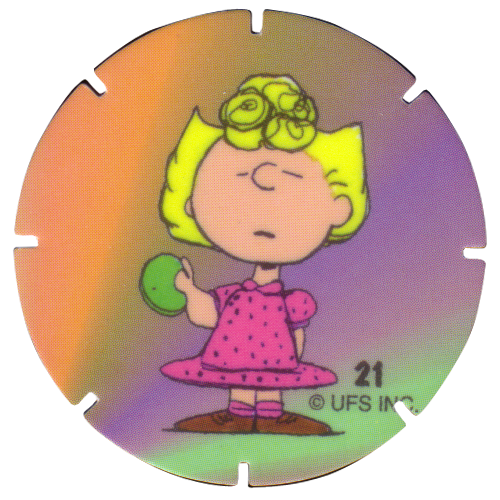 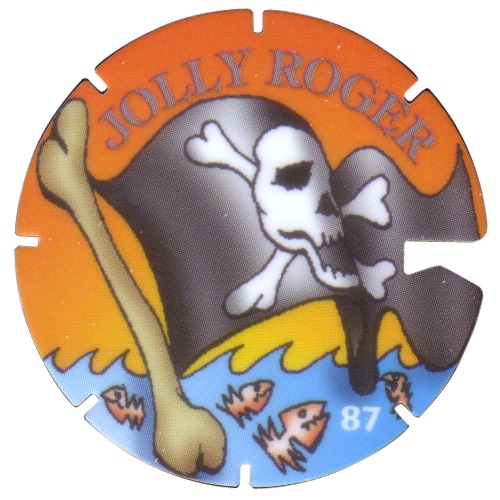 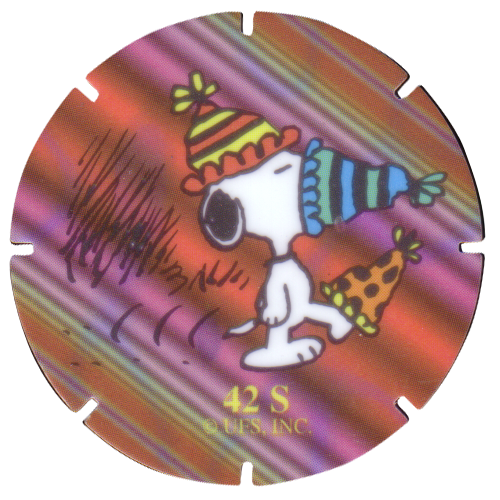 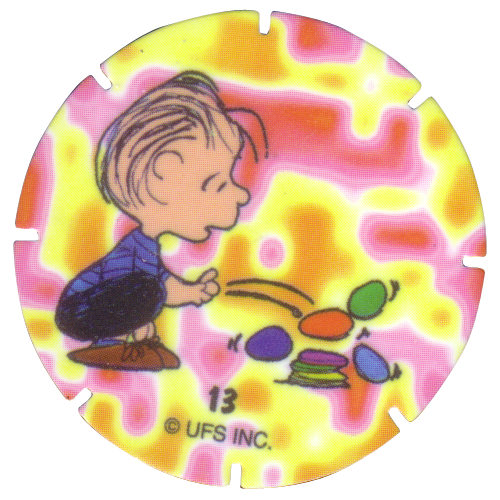 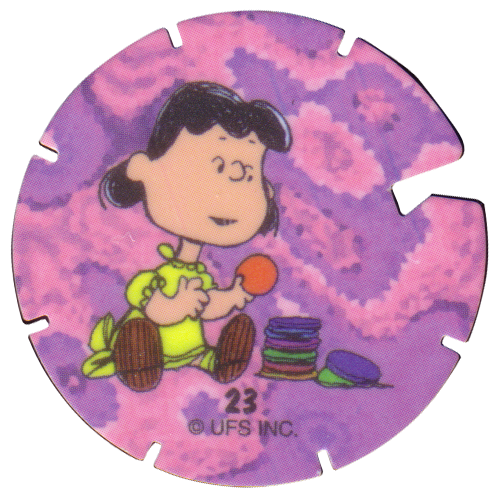 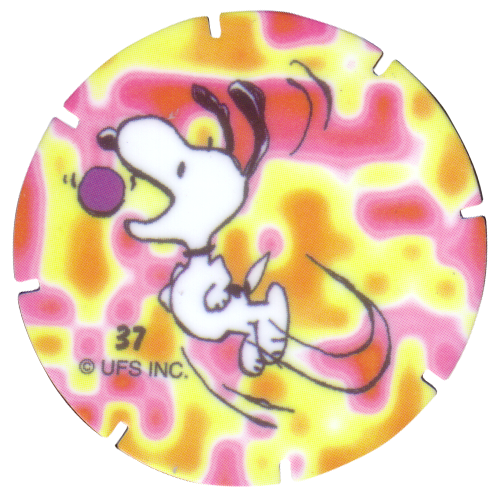 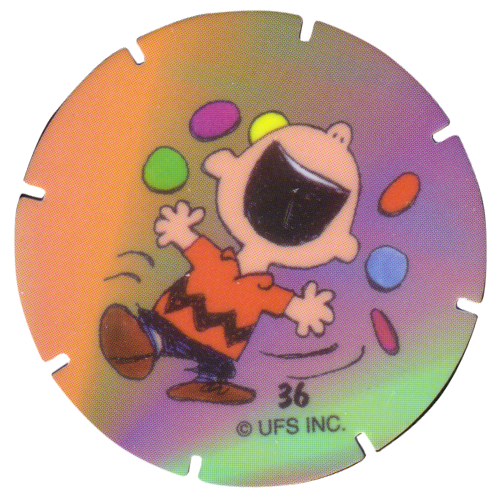 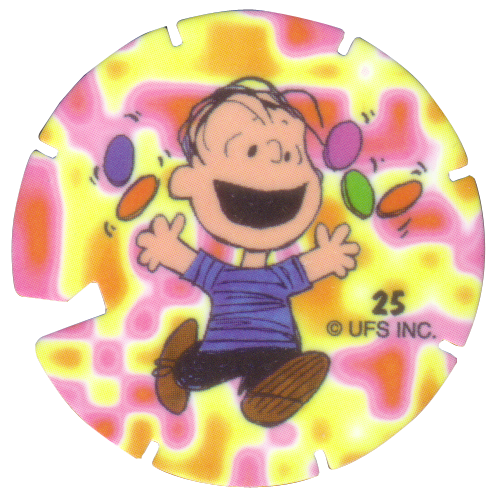 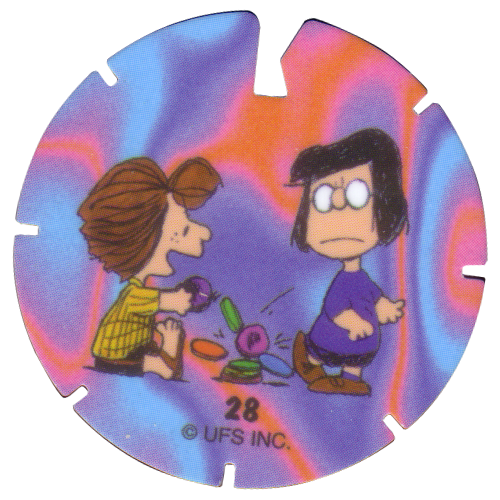 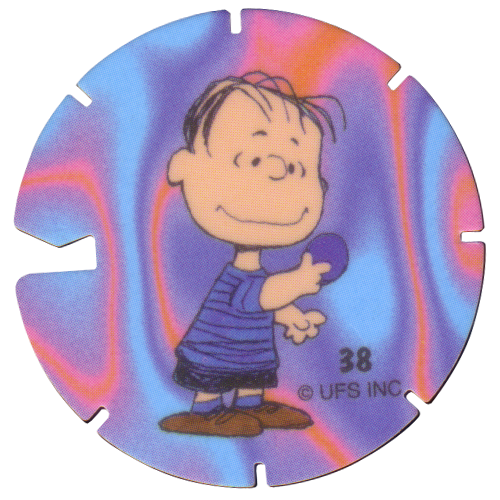 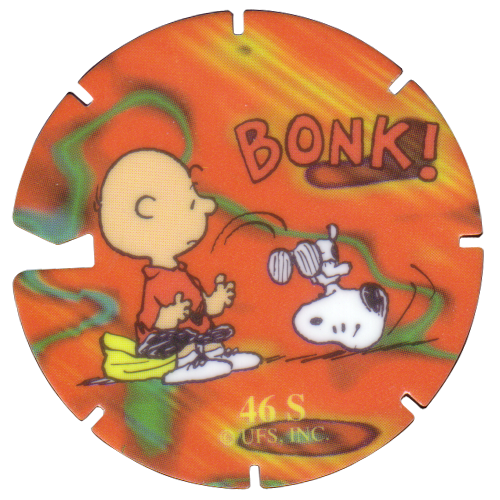 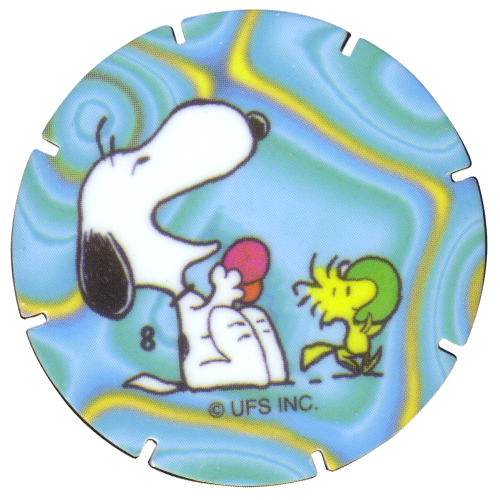 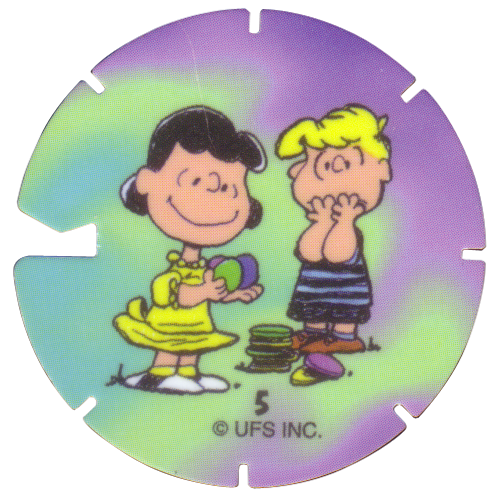 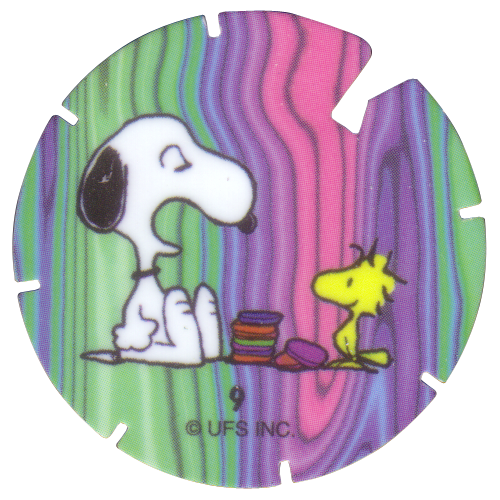 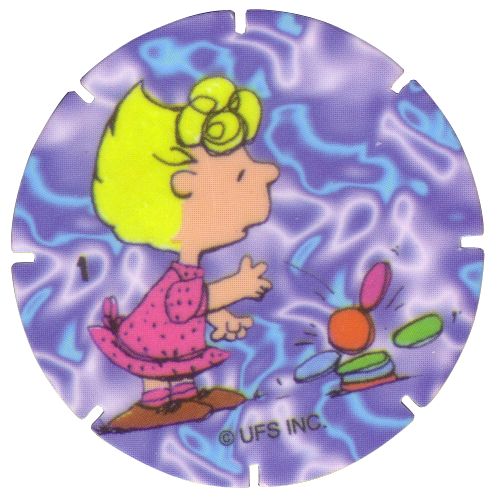 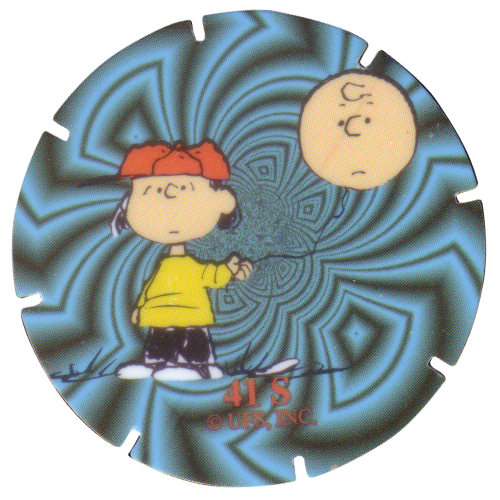 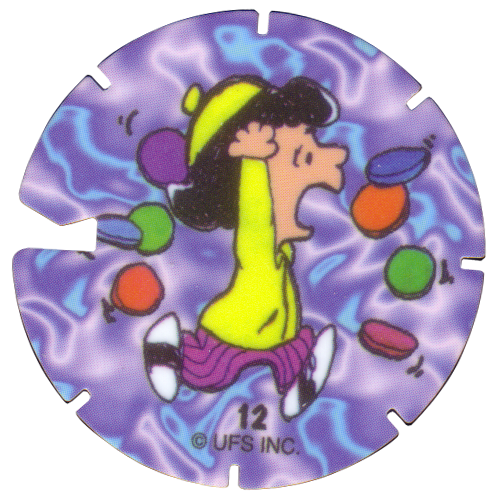 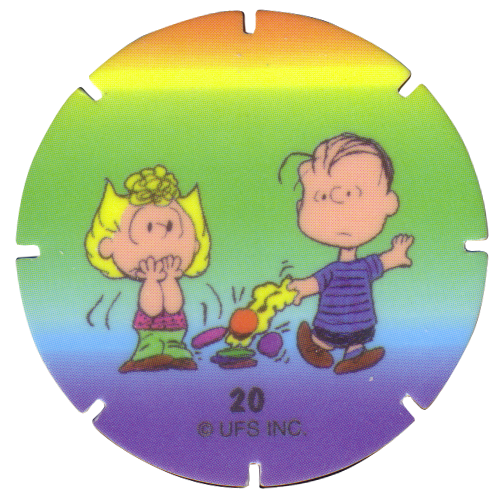 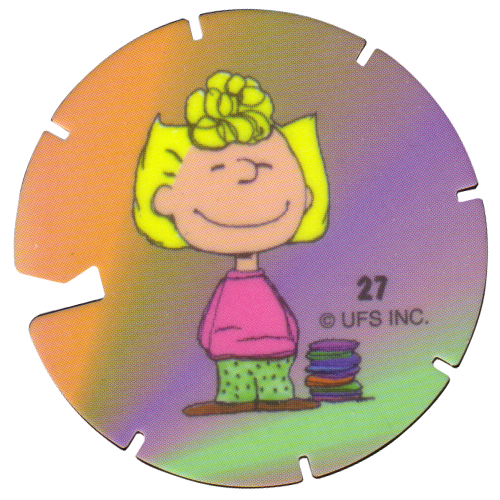 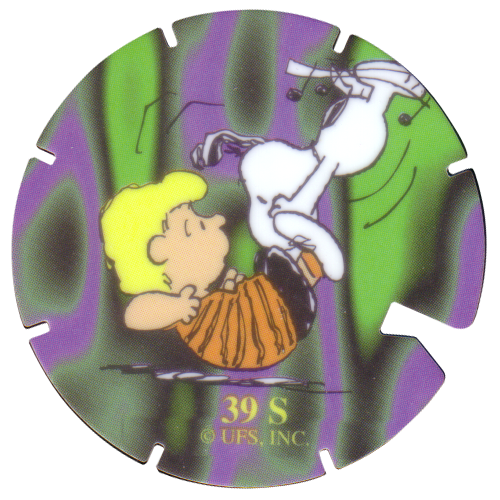 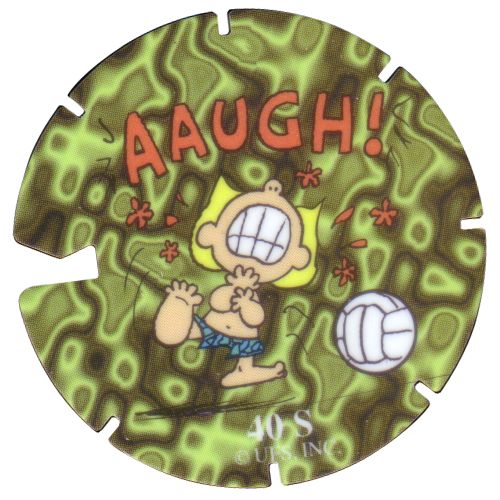 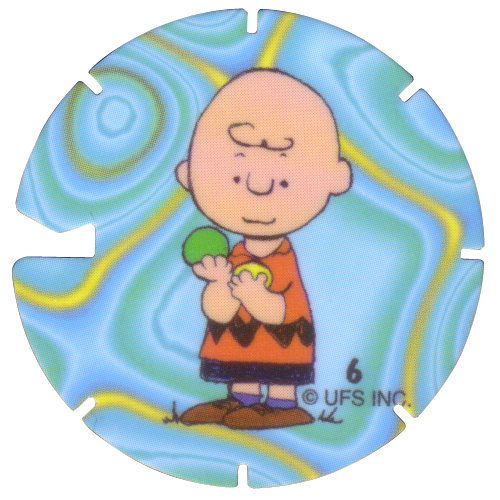 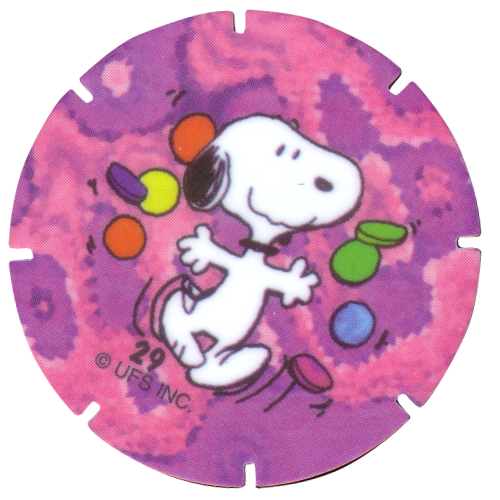 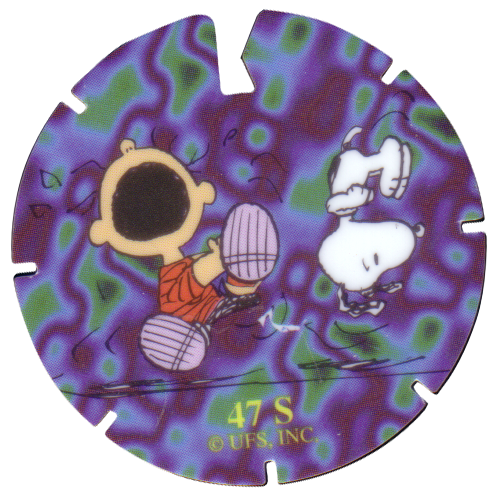 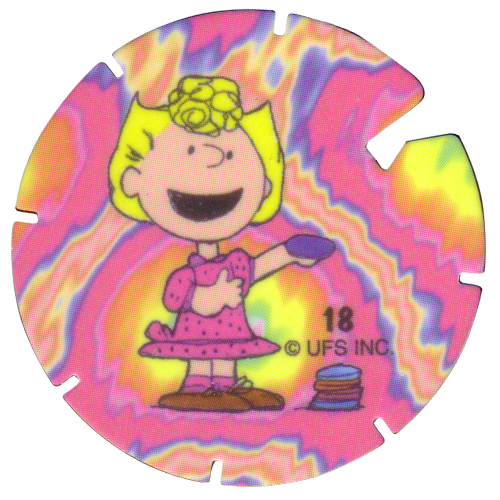 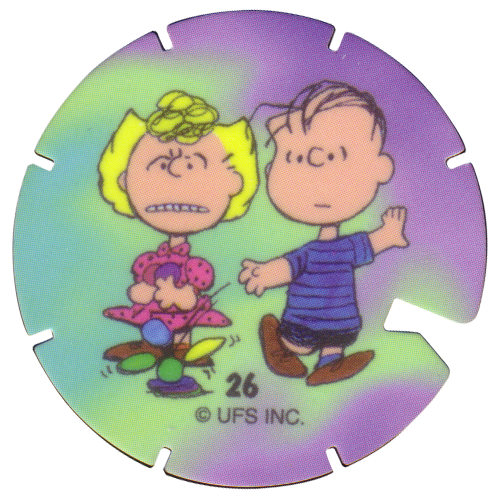 The first 38 are numbered normally and feature characters from the Peanuts comic strip playing pogs. 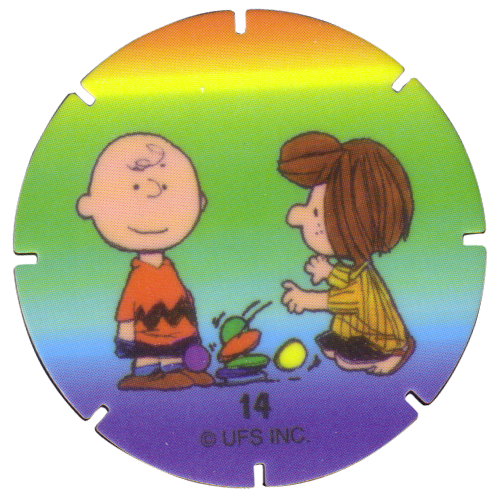 Numbers 39 to at least 49 (possibly up to number 65) have an 'S' after the number, and again, feature Peanuts characters like Charlie Brown and Snoopy. 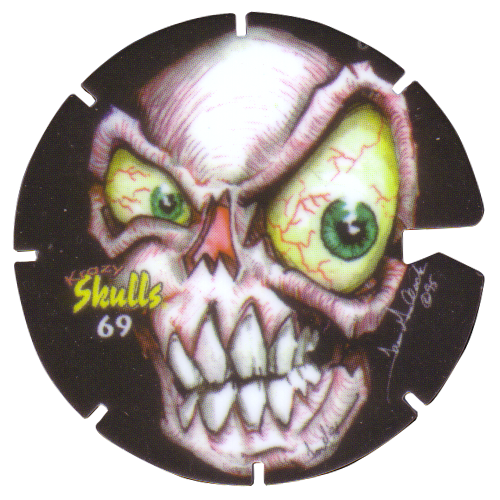 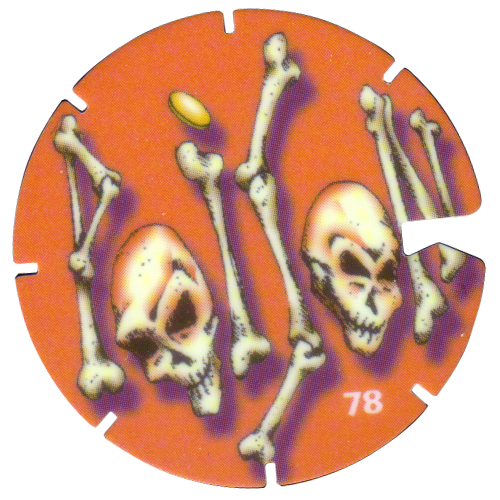 Possibly starting from 50, but at least starting from number 66 to number 69 are 'Krazy Skulls', as are numbers 80-84. 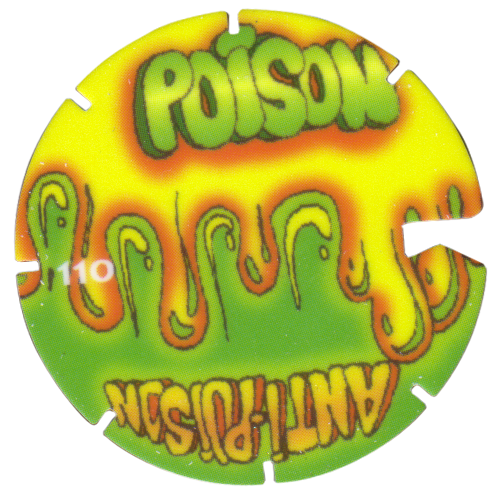 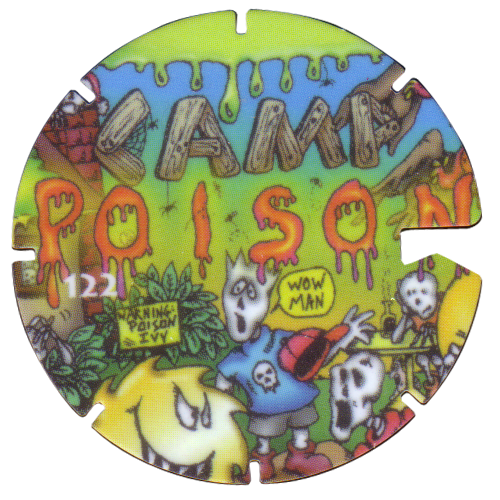 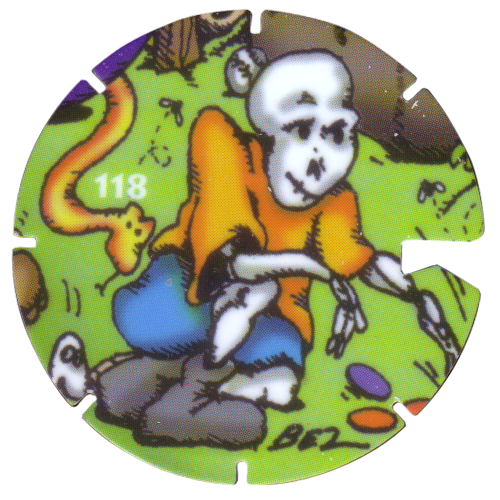 Numbers 117 to 129 (probably to 130) all feature sections from a 'Camp Poison' picture. 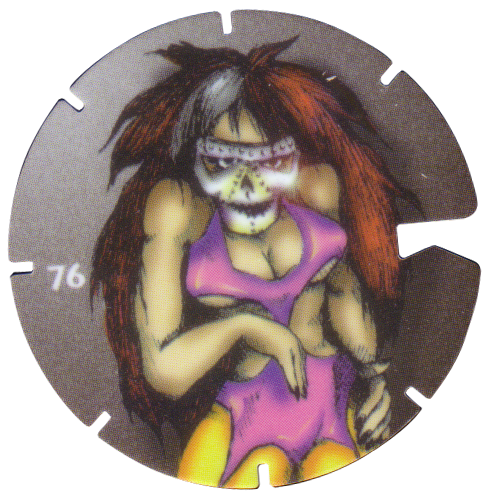 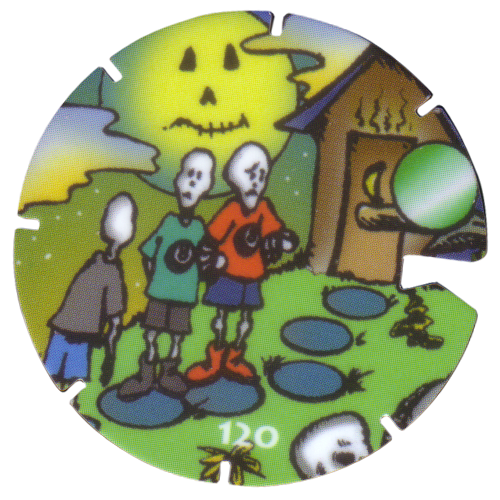 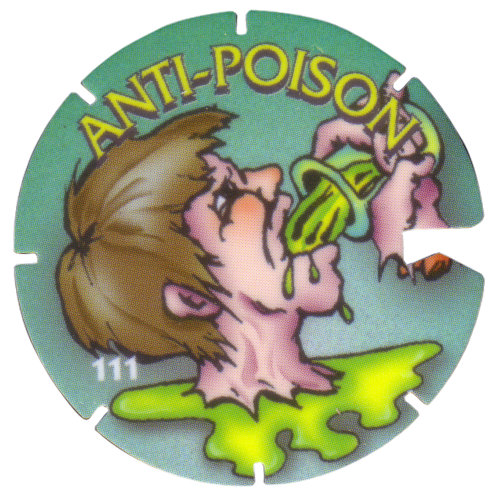 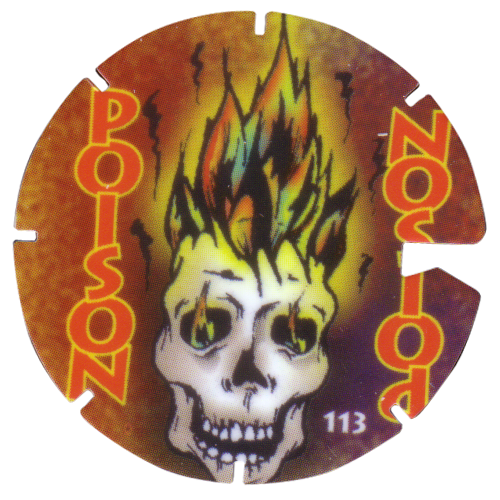 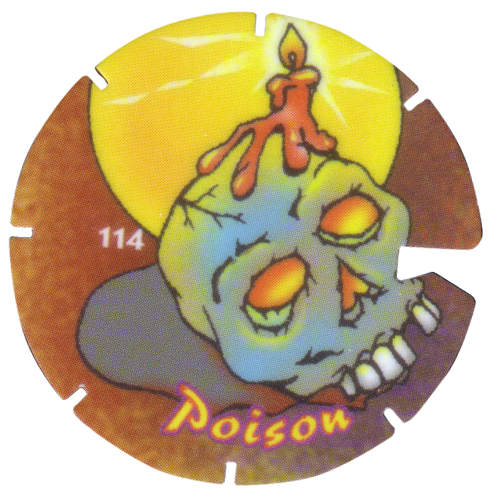 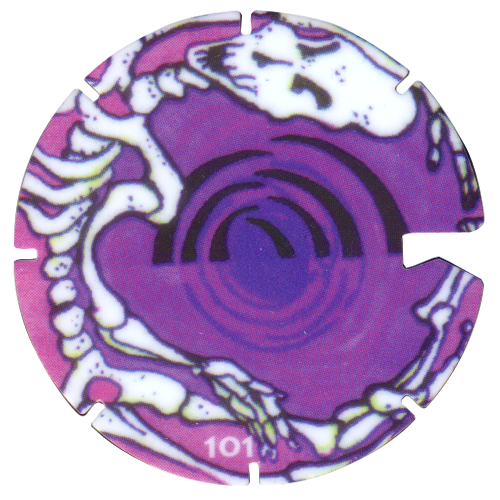 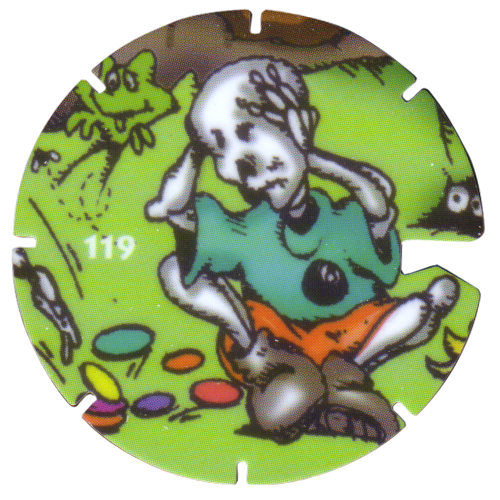 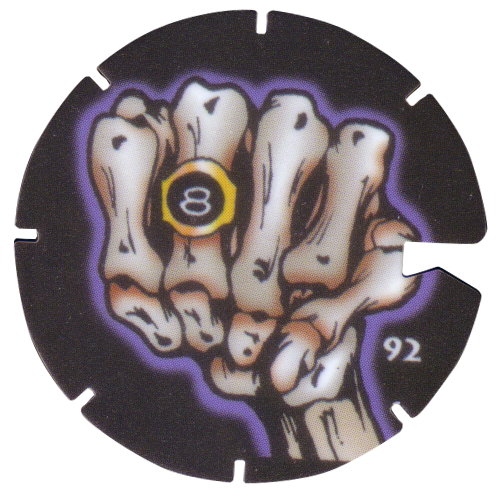 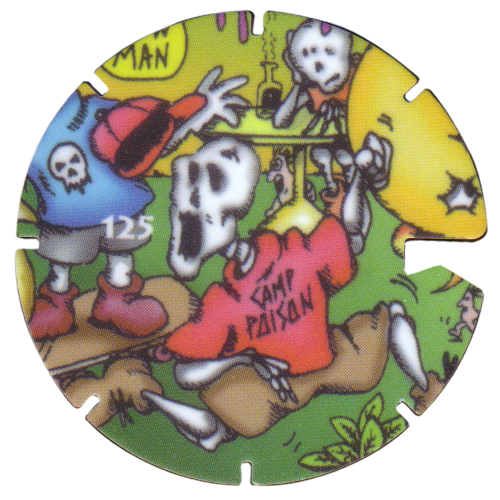 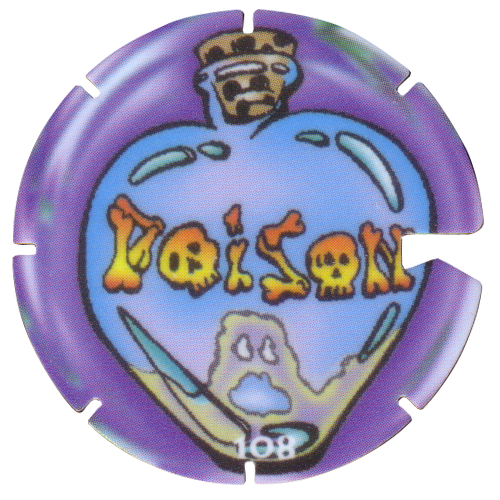 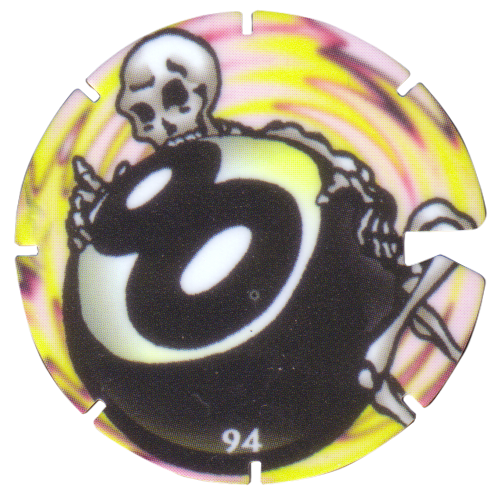 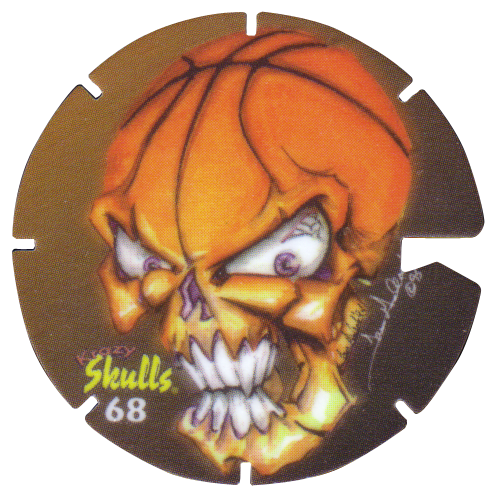 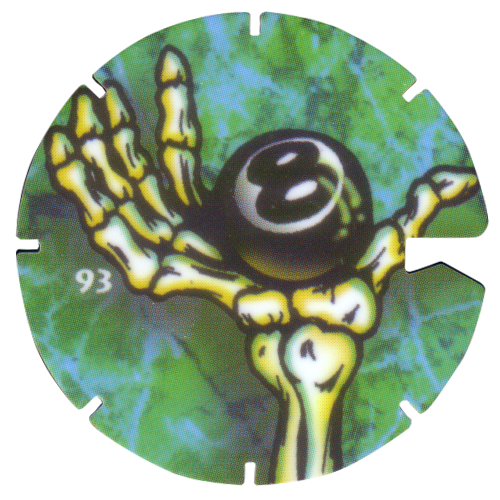 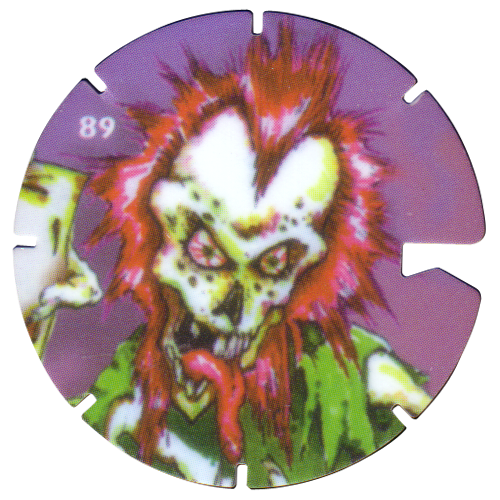 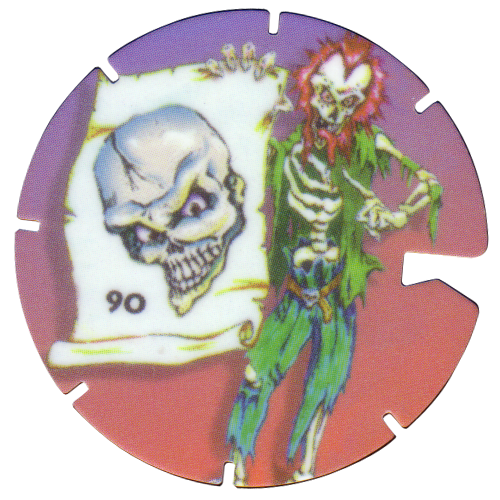 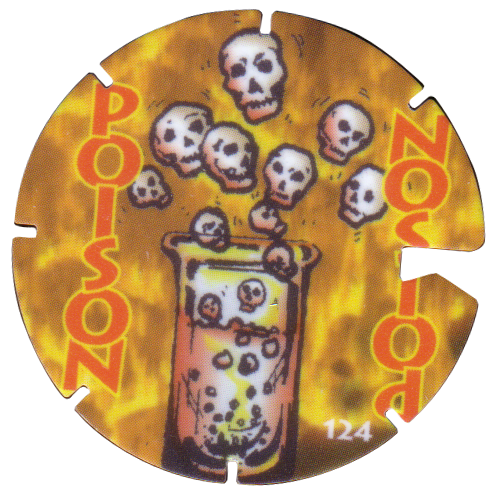 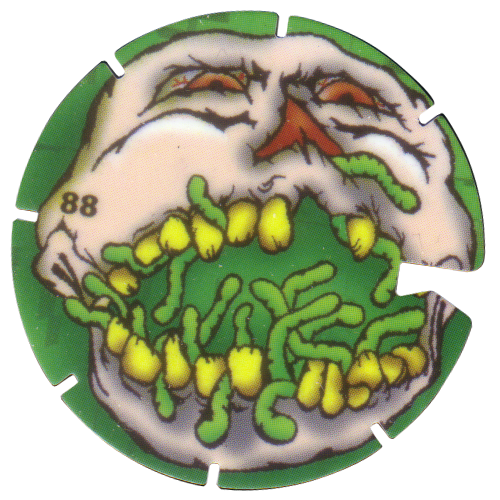 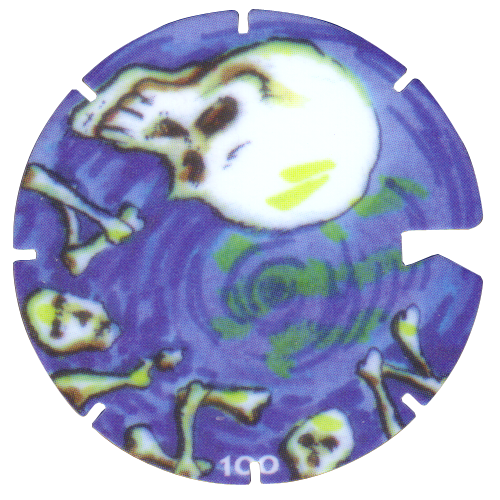 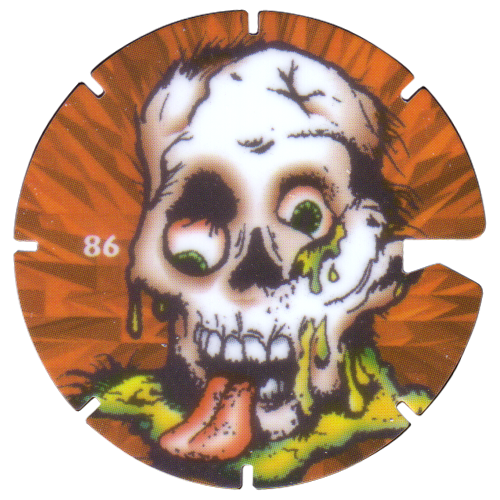 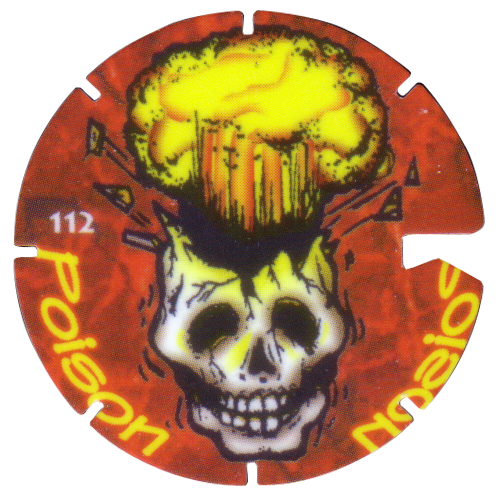 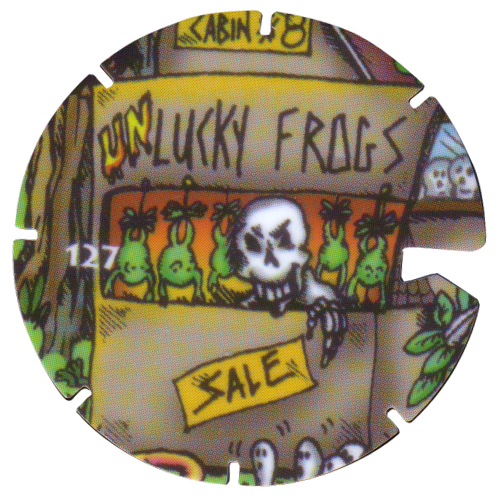 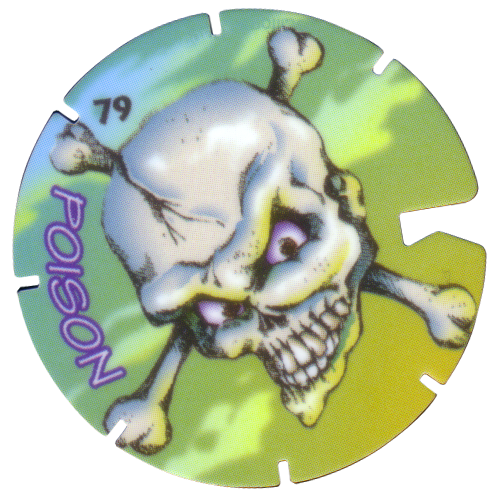 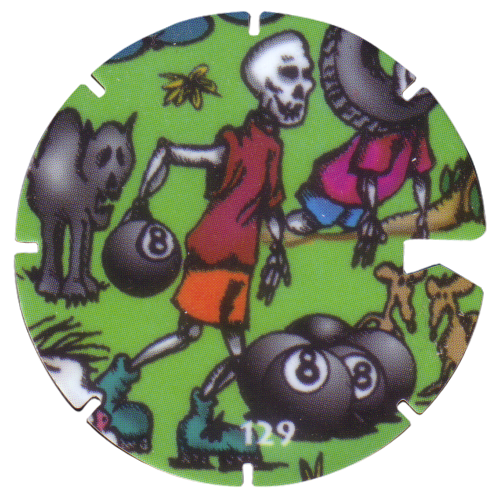 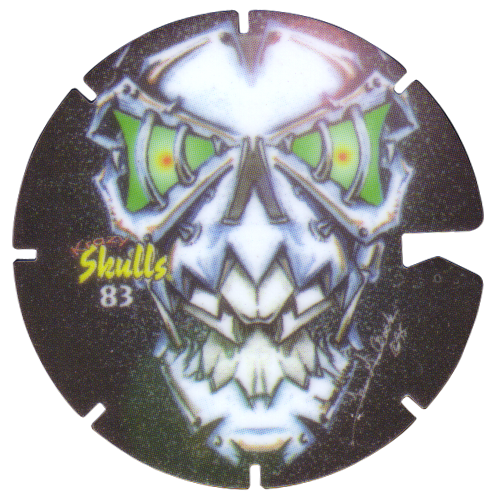 The rest of the Brilliant Frogs Limited Edition Series 1 pogs feature a variety of Skeletons, 8-balls and Poisons. 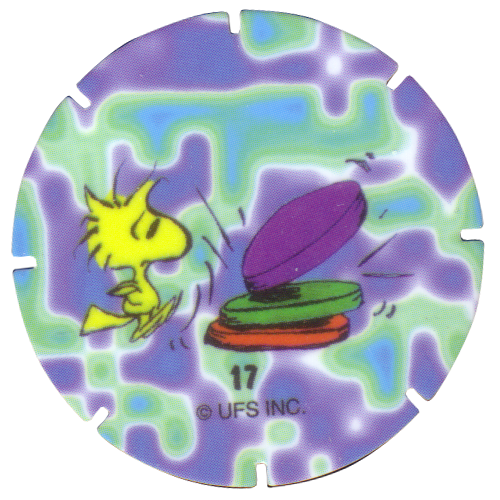 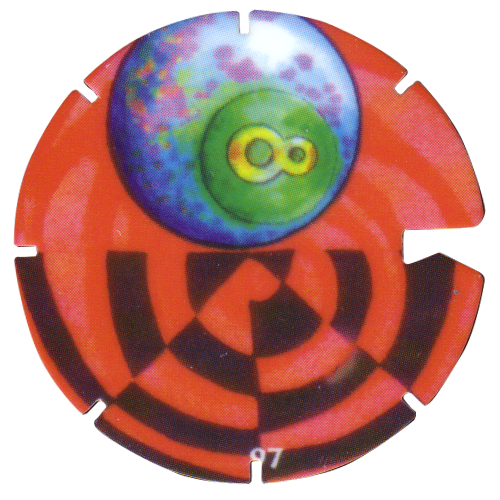 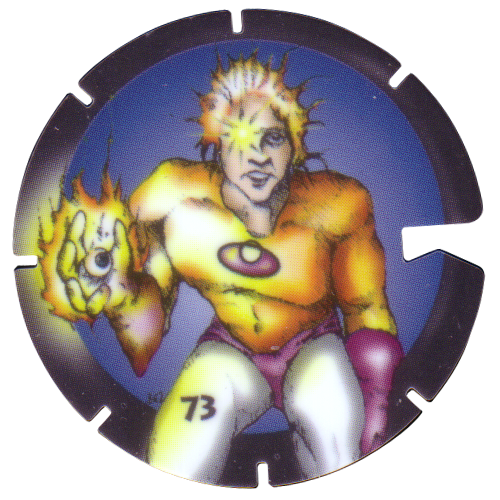 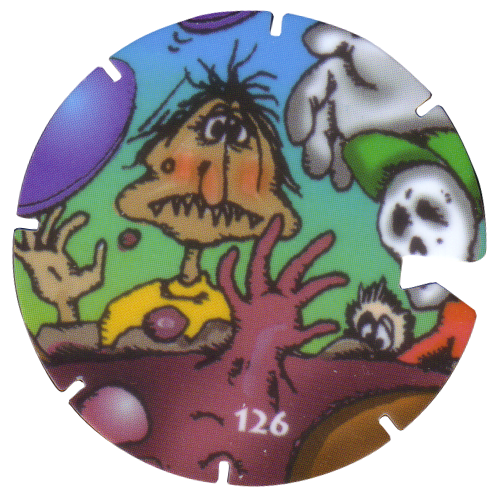 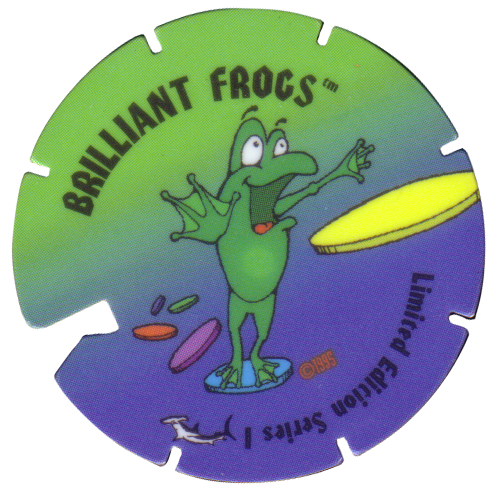 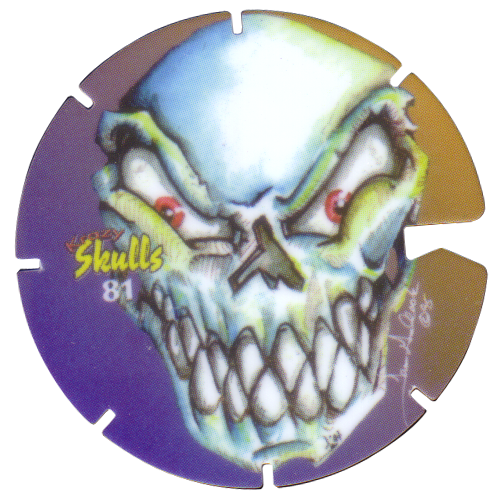 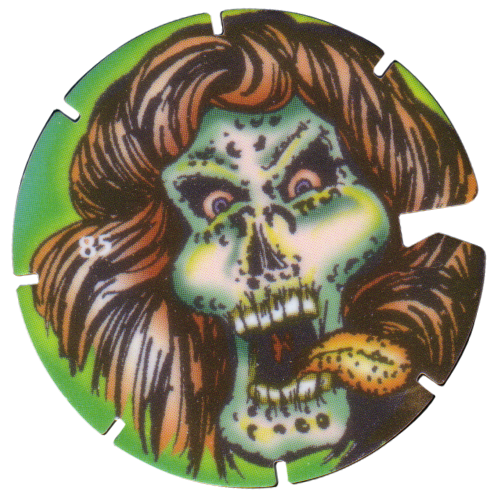 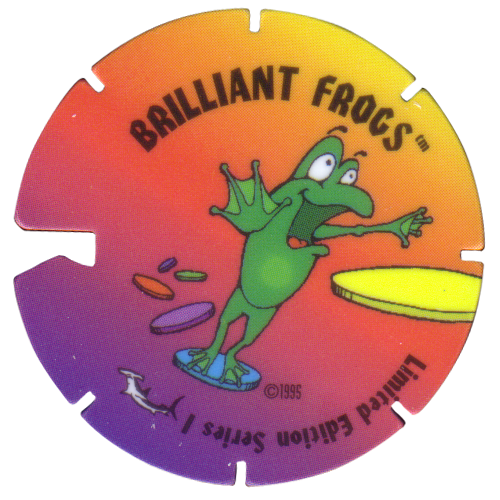 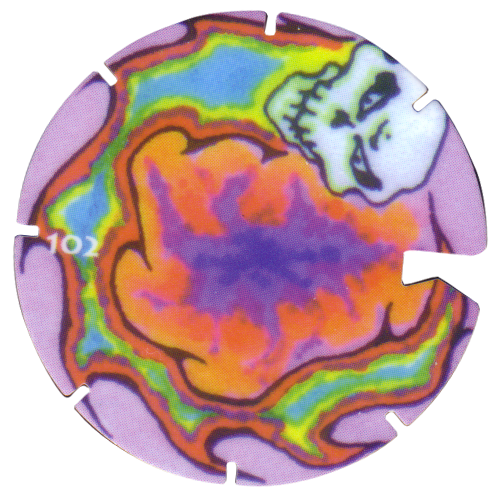 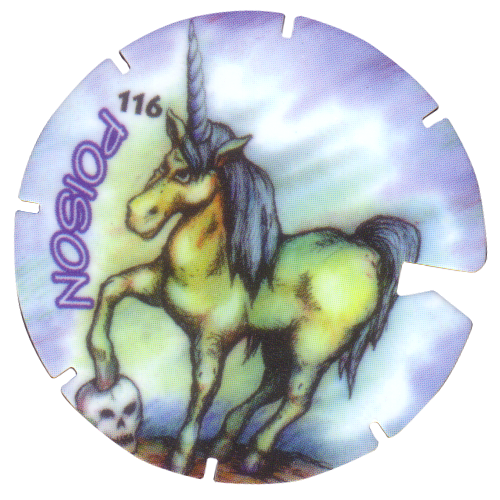 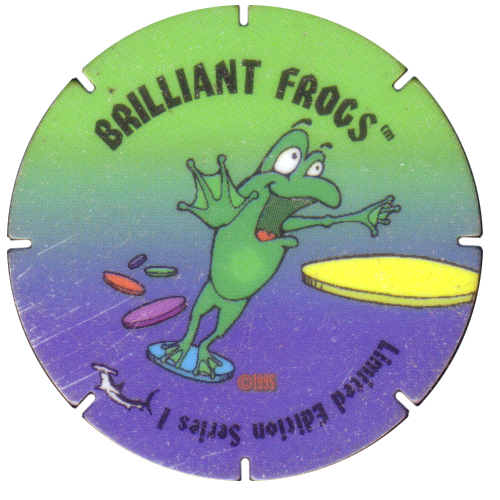 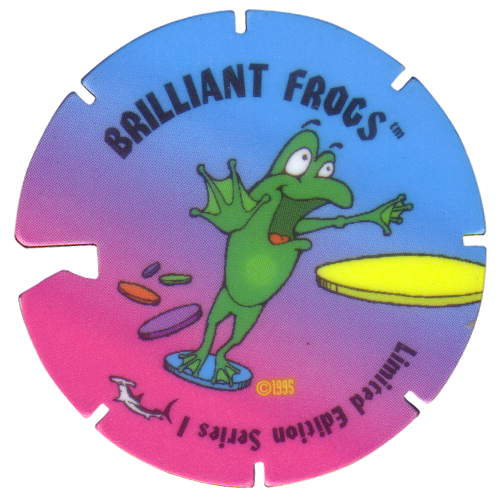 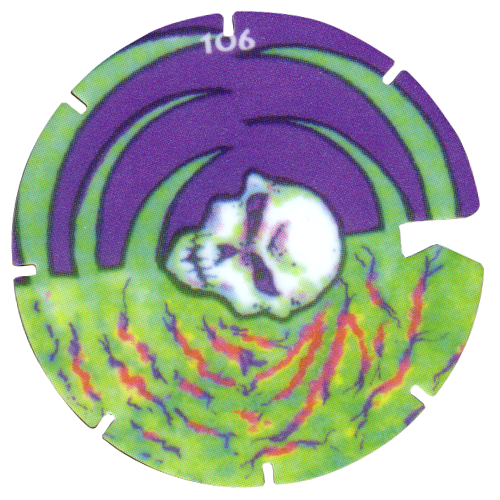 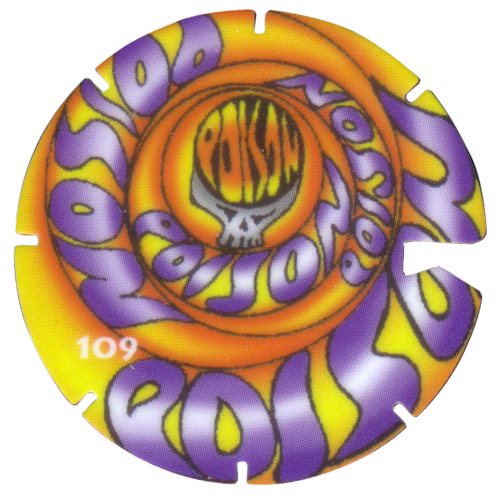 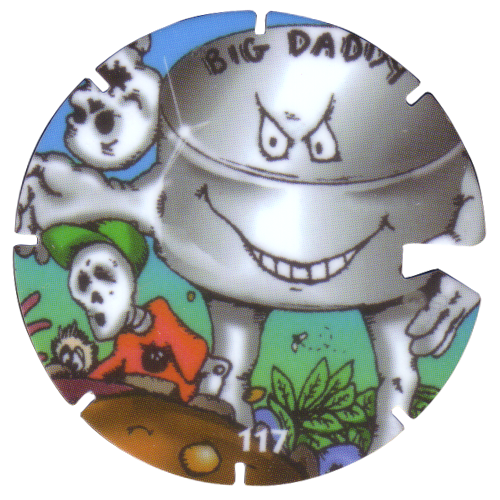 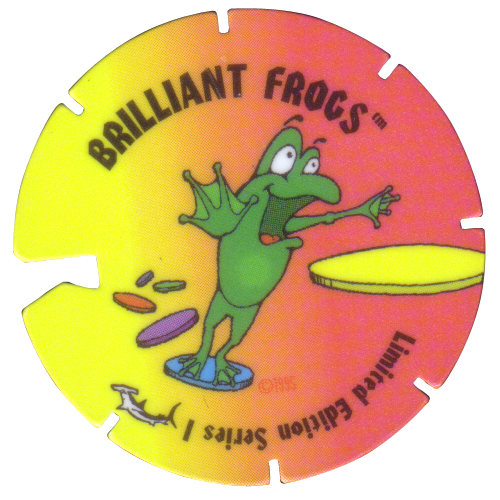 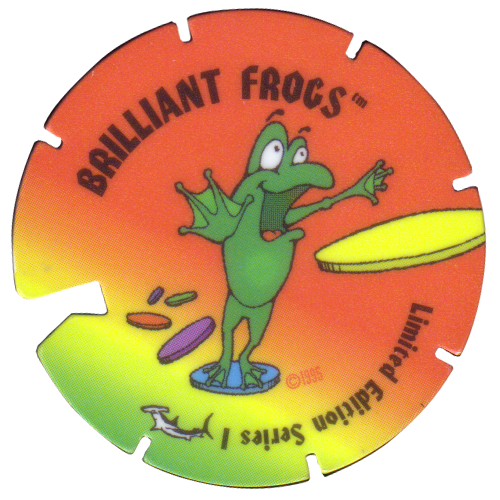 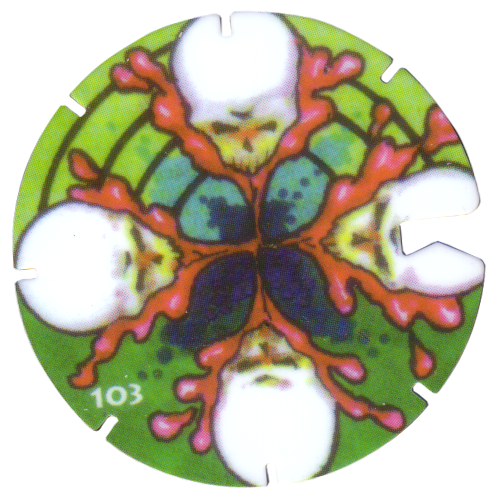 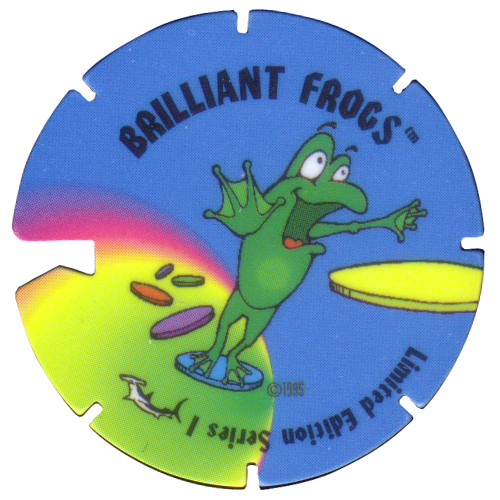 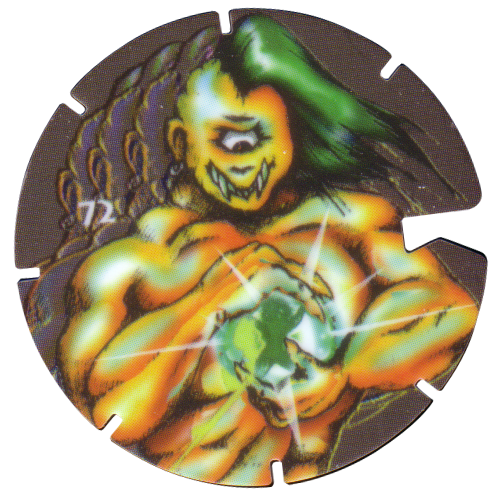 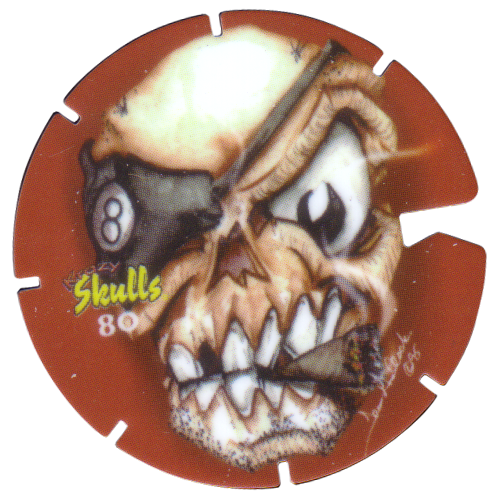 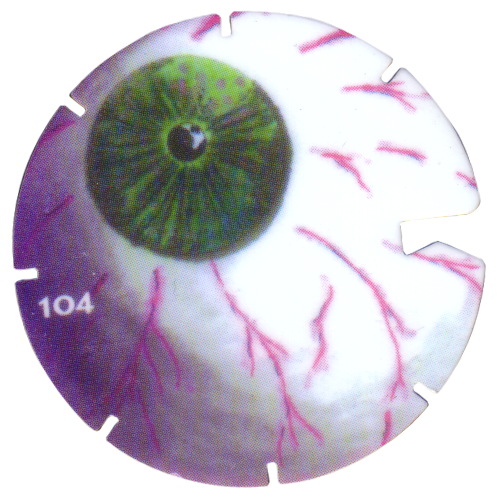 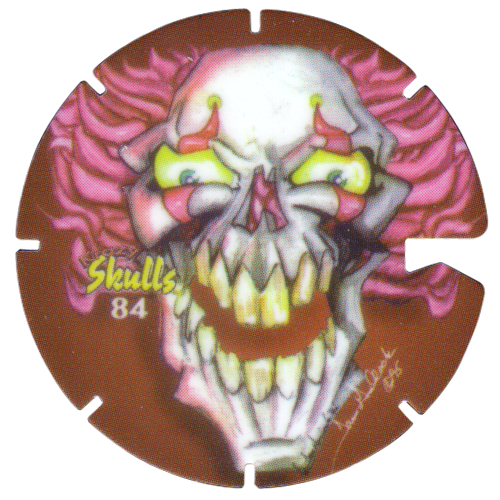 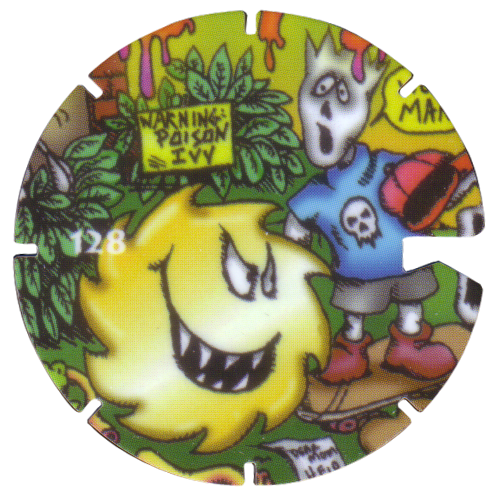 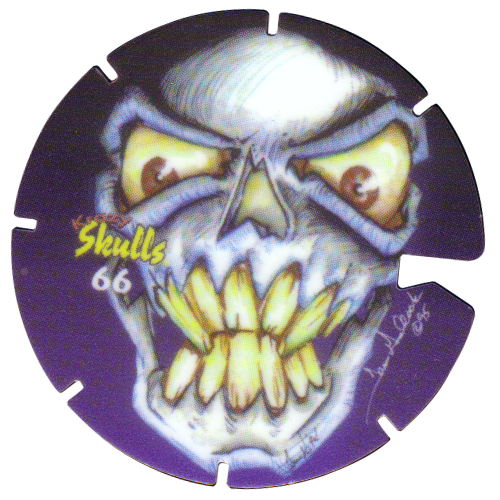 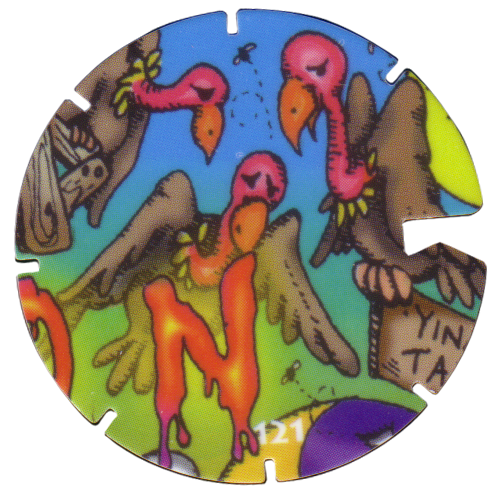 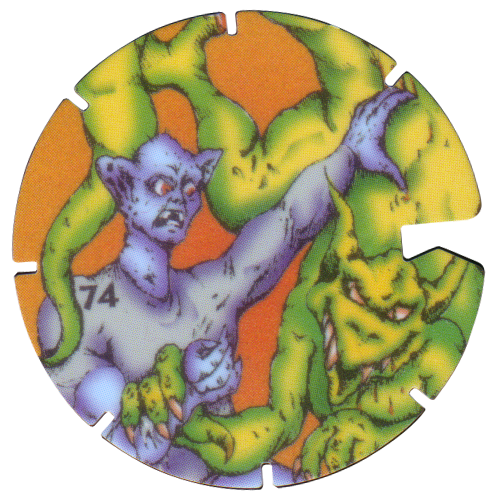 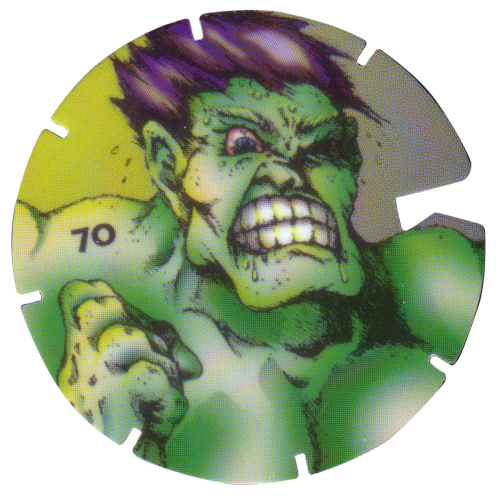 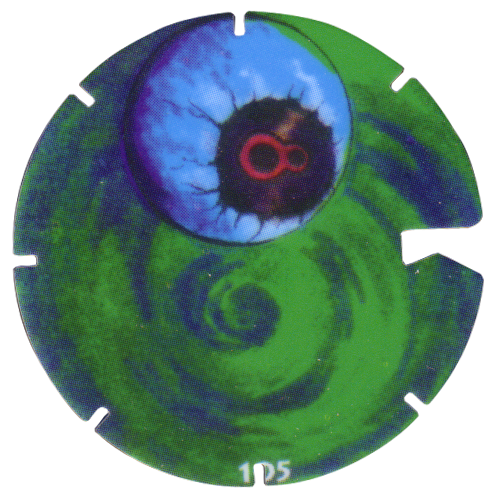 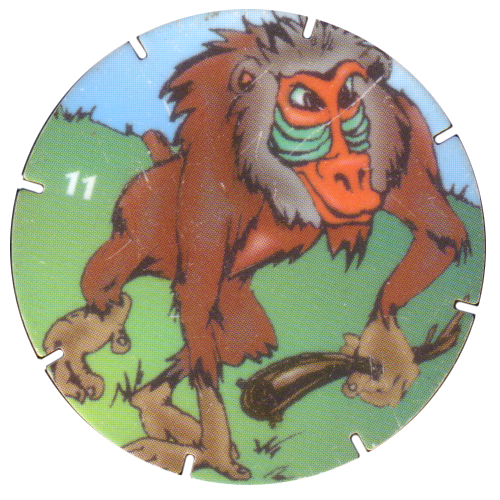 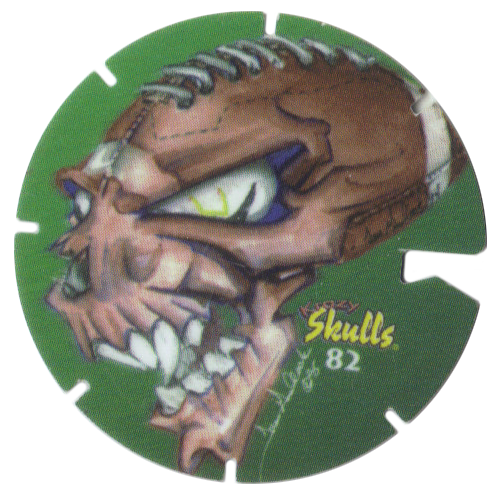 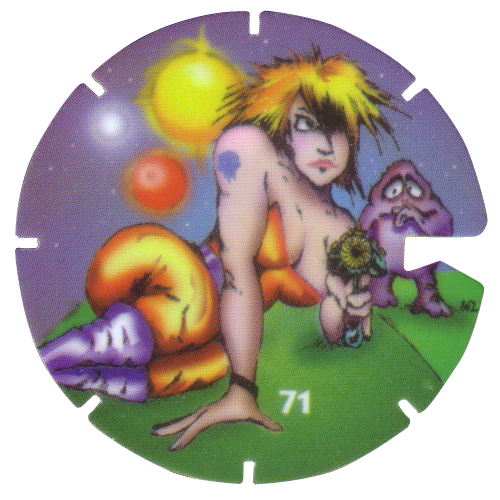 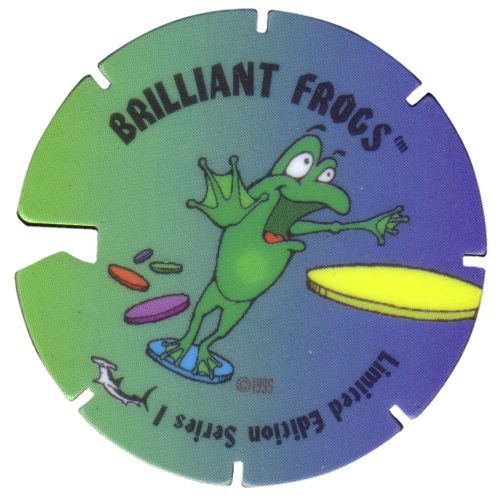 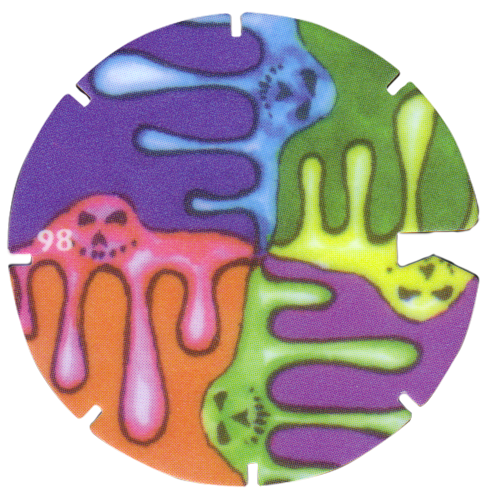 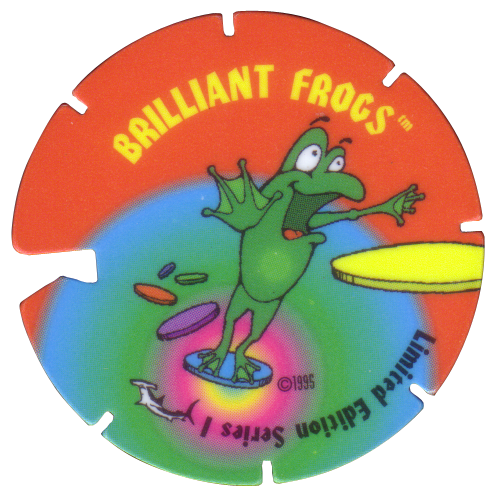 There appear to have been a number of print runs of the Brilliant Frogs tazos made, with each cap available with a range of different coloured backs and with or without a large notch cut into the side of the cap.